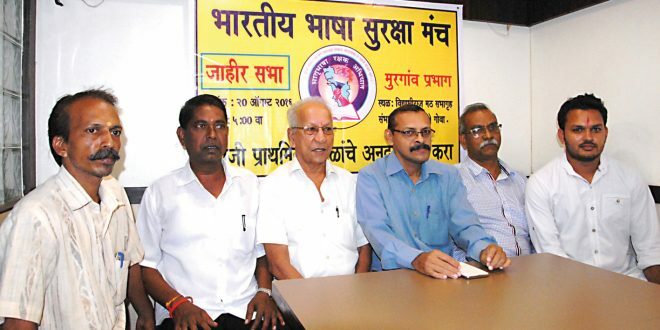 VASCO: Bharatiya Bhasha Suraksha Manch’s (BBSM’s) central committee member Abhay Khaunte, on Thursday, informed that BBSM will decide its future course of action and also reveal about the alternative for Bharatiya Janata Party (BJP) in the state on October 2, the Gandhi Jayanti day. Addressing a press conference in Vasco, Khaunte said the BBSM had extended full support to the BJP in the 2012 assembly election and due to which the party’s candidates were elected with a thumping majority. “BBSM will reveal about the alternative for BJP on October 2 as the BJP has failed miserably to fulfil the assurances which they had given ahead of assembly election of stop grants to English medium schools run by Diocesan Society of Education in the state,” he added. BBSM Mormugao unit president Shrikant Dhargalkar, vice president Dilip Kajale, coordinator Nitin Faldessai, Rakesh Prajapati, Sameer Khutwalkar, Mangesh Tulaskar and Krishnarao Bandodkar were present for the conference. Faldessai said that BBSM is organising a public meeting in Vasco on August 20 to protest against the BJP-led government in the state. The public meeting will be attended by Subhash Velingkar, Subhash Dessai, Uday Bhembre, Swati Kerkar, Naguesh Karmali, Pandurang Nadkarni and others. He disclosed that BBSM has set a target of registering 2 lakh members under ‘Matrubhasha Rakshak Abhiyan’ all over the state. “Presently, there are around 500 to 600 members of Matrubhasha Rakshak Abhiyan in the whole of Mormugao taluka which comprises four constituencies of Mormugao, Vasco, Dabolim and Cortalim,” Faldessai said. He was confident that around 1500 people would attend the public meeting scheduled on August 20.